The Assembly ruckus of last week was replaced by diligence and pragmatism yesterday. We proved that, we too have “good behavior”! Thankfully, Opposition friends too were actively involved and were gracious enough to accept the verdict! Behind smooth conduct of yesterday’s proceedings, there were elaborate security arrangements. Hundreds of white clad marshals were all in place ready to face revolt either physically or verbally. They had the ‘noble’ responsibility to keep the House in order by politely shifting the nonsense creators out of the House, meanwhile silently encountering any kind of chagrins by them. It set me thinking, for whose good all these arrangements? Members of Legislature are law makers in literal sense; they have the vested authority to lead the common man, frame the laws, so that the Society looks up to progression. Look at the paradox. The System weeps silently for a protection from their impatient fury! What we are repeatedly witnessing from politicians these days is the relentless wielding of strings of power wagon to their personal agendas, which otherwise should have been a tool to build the Society. I am afraid we are increasingly crossing “Lakshman Rekha” of power and seem to be leading people only through negative examples. The last Monday’s action and the reactions that were reported later in media and elsewhere have only delinked the already weakened chain of trust between the common man and his representative. The ghastly scenes of a member who was a Minister just a fortnight ago tearing off his shirt and expressing his mouthful of anguish standing atop the benches and few others kicking the doors of the August House by threatening the duty bound Police, will surely be remembered by the people for a longer time. Mind you these ‘galattas’ were not for upholding the common man’s right, instead they were for the sake of ….. ..! Can the persons representing people behave in such a despicable manner? Have they been authorized by people authorized to conduct this way? It’s a typical case of people knowing more about their rights but never want to be controlled by rules and regulations. It is high time, the political leaders think and start finding out the real remedy, lest these wounds fester further and swallow the whole of remaining minimum. Depressingly, Governance again takes a complete backseat by the tumultuous petty politics. My sentiments are with those who are deeply distressed and disturbed. I AM DEEPLY SADDENED OVER THE DETERIORATING TREND OF POLITICIANS WHO HAVE LOST RELEVANCE TO THE SOCIETY EXCEPT AS NEGATIVELY PORTRAYING THEMSELVES AS CRIMINALS WHO HAVE TO BE DEALT WITH AN IRON HAND BY CONTAINING THEM THROUGH AMENDMENTS TO THE CONSTITUTION TO DEBAR THEM FROM POLITICS WITH MEDIA AND JUDICIARY TAKING AN ACTIVE ROLE AS PROTECTORS OF PEOPLE OF INDIA. As a law minister, please take action against the MLA who broke the window in the Vidhana Soudha, The person who kicked the door, MLA who slapped the marshal and the opposition leader who manhandled Shankar Bidari. If a ordinary person does this what will be the consequence??. Also, order investigation of Zameer Ahmad's hawala money, Bribery offer by HDK to Appacchu Ranjan, M. Quattrohi's visit to Deve Gowda, Gowda's benamy property in Bangalore and release the evidence to public. Otherwise, even BJP sympathisers will loose trust in your Govt. Nobody will believe in these allegations, unless you provide the evidence. In case President's rule is declared, these investigations can not be stopped. Lot of damage has been done by Katta Jagadish's involvement in KIADB scandal and Ramachandra Gowda's involvement in Medical college appointment scandal. Honest and people with integrity like you and Dr. V.S. Acharya who have come from RSS background should not be mute spectators to the disintegration of BJP. Again BSY and BJP lost a golden chance to make Karnataka another Gujarat in Development. BSY should stop making daily pilgrimage to temples all over the country and concentrate on administration and believe in "Kayakave Kailasa", "Janata seveye Janardhana Seve." Let us hope and pray that BJP can rule for next 30 months and continue the good work. The meaning of Rajneethi has evolved through decades and is in its worst stage. I know you are one of the few politicians who have retained their morality,individuality and worked for the people. You are successful as a person but as a system you have failed to serve the people. The BJP government is more corrupt compared to the previous governments. The BJP also started the bad tradition called 'OPERATION KAMALA' which is the greatest mistake done by BJP. I am not just pointing to BJP,all the parties are doing the same traits but as the ruling party you should be more responsible and aware of your duties. You just stand out from the BJP politicians. How I wish other colleauges in your ministry takes you as a role model. what makes me worry is that BJP is talking of second phase of 'Operation Kamala'! Pl advise them properly. We need some role models to show it to our youngsters. Now I show politicians and tell children dont imitate them. Why can't the Speaker controll the assembley in real sence, by removing all misbehaving members? 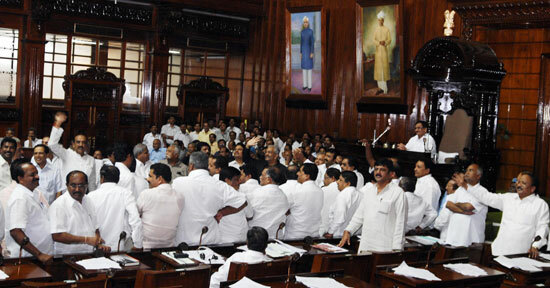 I'm not suggesting this as BJP activist,but the people who created ruckus in the assembly during the last session after which the CONGRESS took a padayatra have rowdy attitude,they neither discuss any issues NOR participate in debates on the floor of the house!! they ONLY flex their muscles,One man very visible is ZAMEER AHMED!!!! !Time and again he has proved that he has scant regards for the house and acts like a hooligan in the house!INITIATE action aginst all the members aginst whom enquiry was ordered and proved for misbehaviour in the house!!! Sureshji i humbly request you to assert your role as LAW and PARLIAMNETARY AFFAIRS MINISTER and show how the power can be used just like the LOK AYUKTA has been using his powers to expose the CORRUPT! Lord has granted Power Thru the people to our honourable CM to help the needy. Please suggest the honourable CM to tour the flood afected people of NORTH KARNATAKA ,monitor the rehabilitation and take corrective actions!!!! All the lords will bestow their blessings to the CM!! As a responsible citizen I am really worried about the political situation in our State (Karnataka). It is always been understood that Karnataka is a place of peace and the people living here are soft natured, cultured and soft behaved individuals. I believe that the morality of the politicians in our state (except a few like you) has gone down.Why do not they think a while before they act? These days media's approach has become very strong than before. People across the globe watch the happenings of the Karnataka politics. What will they think of us? Will they come forward to invest in our State? Being called a Silicon city, Bengaluru is one of the advanced and developed technology city in the world. A responsible politician must always think and act in terms of the development of his place.I am not targeting any political party here. All politicians are the representatives of their own constituency. Development Mantra should always be on their tongue. ರಾಜಕೀಯ ಕ್ಷೇತ್ರದಲ್ಲಿ ನಾನು ಕೂಸಾಗಿ ಕಣ್ಣು ಬಿಟ್ಟಿದ್ದೇ ಕಾಂಗ್ರೆಸ್ ಪಕ್ಷದಲ್ಲಿ. ಆದ್ದರಿಂದ ಈ ಪಕ್ಷವೇ ನನ್ನ ಹೆತ್ತಮ್ಮ. ಹೋರಾಟದ ಹಾದಿಯಲ್ಲಿ ನಡೆಯುವುದನ್ನು ಕಲಿಸಿದ ಹಾಗೂ ಜನಸೇವೆಗಾಗಿ ಯೋಚನೆ ಮಾಡುವ ಮತ್ತು ದುಡಿಯುವ ಪಾಠವನ್ನು ಕಲಿಸಿದ ಮೊದಲ ಗುರುವೂ ಹೌದು. ಸೋಲಿನ ಕಹಿಯನ್ನು ಉಂಡಾಗ ಸಾಂತ್ವನ ಹೇಳಿದ ಹಾಗೂ ಗೆದ್ದು ಸಂಭ್ರಮಿಸಿದಾಗ ಜನರ ಹಿತಕ್ಕಾಗಿ ಸ್ಪಂದಿಸುವಂತೆ ಸರಿಯಾದ ದಾರಿ ತೋರಿಸಿದ ಈ ಮಹಾತಾಯಿಯನ್ನು ಎಂದೂ ಬಿಟ್ಟು ಹೋಗಲು ಸಾಧ್ಯವಿಲ್ಲ. ನಾನು ಹಾಗೆ ಮಾಡುತ್ತೇನೆ ಎಂದು ಸುಳ್ಳು ಸುದ್ದಿ ಹರಡಿದ ಎಲ್ಲರಿಗೂ ಇದೇ ನಾನು ನೀಡುವ ದಿಟ್ಟ ಉತ್ತರ. I am really very sorry to have missed the VIJAYA DASHAMI ROUTE MARCH of RSS this year, bcoz I was DEEPLY DISGUSTED of the state of affairs of DIRTY POLITICS which could not be moderated by RSS. May be Late AJITH KUMARJI would have dealt with such situations more firmly. I was very much upset with the newly installed arrogant person sitting in the key post of HOME affairs.